I spent a lot of time on the phone with MailChimp support this evening trying to figure out why their editor is so bad. I told them that when I selected a block of text and formatted it as Lato 14, it kind of did something, but it didn’t format it as Lato 14. She explained that if there’s strange formatting it is probably messing things up. So I’m like, yeah, I get that. That’s why I selected the whole thing and reformatted it using your formatting tool. Turns out, that formatting tool doesn’t let you change formatting, if the formatting is actually messed up. Ok. Why is it there then? Is this like an elaborate placebo experiment? Do I get like $4.19 later for being part of the study? Anyway, turns out there’s a fix. Select all the text you want to format. 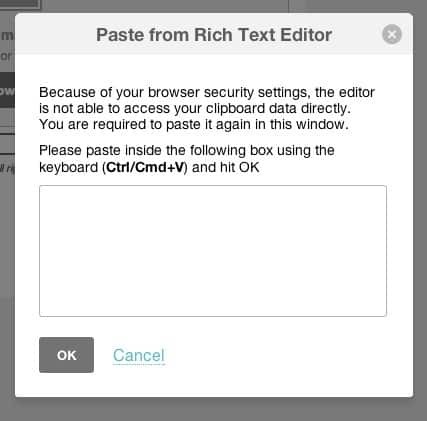 Select the “Paste from Rich Text Editor” option. Paste your text into the little dialog box and paste it. Your text will now truly be without formatting (except for basic stuff like bullets and links). You can also strip everything, including bullets and links and such, with the option next to it. Finally, you can click the <> icon to see the code view of what you have. It should show some pretty clean content at this point. If you look at your code using this tool before you do the special pasting (and when you’re having drama), you’ll see all manner of filth in there. Don’t trust the formatting tool. It’s rubbish. Cut everything out before you post, paste it in using the Paste from Rich Text Editor tool. Re-apply your formatting as desired. Hope this helps someone return from the brink of violence.